Reid Ewing draws upon case examples of some of today's most acclaimed developments in Best Development Practices, and recommends best practice guidelines to help developers create vibrant, livable communities and still make money. For years, Florida's planners and developers have had to deal with some of the most difficult growth management problems. Now planners and developers across the nation can benefit from the valuable lessons Florida offers on combating urban sprawl. Ewing first searched the state for the best contemporary developments, then distilled their lessons into guidelines for directing new development and assessing the quality of existing development. 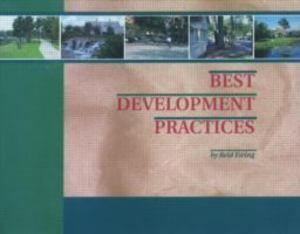 The 43 practices outlined in this exciting book cover four areas of development land use, transportation, the environment, and housing. They apply to a broad range of development projects, including small planned communities, residential subdivisions, and commercial centers. The book's recommendations are based upon the experiences of successful developers and supported by empirical research. The proof lies in the compelling real-world examples Ewing highlights throughout the text. Illustrated with dozens of photographs and written in a lively style, Best Development Practices is must reading for all those seeking better ways to plan and design communities. Developers will find proven, feasible land development regulations and benchmarks against which to evaluate development proposals."